Such is our desire for progress, we haven’t even launched 5G but the best and brightest around are already considering what 6G will bring to the world. It does kind of make sense though, to avoid the dreaded staggering of download speeds and the horrific appearance of buffering symbols, the industry has to look far beyond the horizon. If you consider the uphill struggle it has been to get 5G to this point, and we haven’t even launched glorious ‘G’ properly, how long will it take before we get to 6G? Or perhaps a better question is how long before we actually need it? This is perhaps the issue which we are facing in the future; the sheer volume of ‘things’ which will be connected to the internet. As Petty points out, 5G is about being bigger, badder and leaner. Download speeds will be faster, reliability will be better, and latency will be almost none existent, but the weight of ‘things’ will almost certainly have an impact. Today’s networks haven’t been built with this in mind. Trying to find consensus on the growth of IOT is somewhat of a difficult task, such is the variety of predictions. Everyone predicts the same thing, the number of devices will grow in an extra-ordinary fashion, but the figures vary by billions. 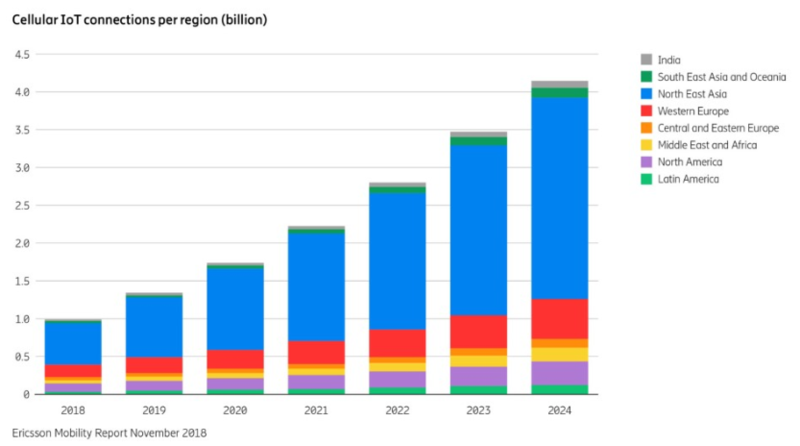 Using Ericsson’s latest mobility report, the team is estimating cellular IoT connections will reach 4.1 billion in 2024, of which 2.7 billion will be in North East Asia. This is a huge number and growth will only accelerate year-on-year. But here is thing, we’re basing these judgments on what we know today; the number of IOT devices will be more dependent on new products, services and business models which will appear when the right people have the 5G tools to play around with. Who knows what the growth could actually be? Another aspect to consider is the emergence of new devices. As it stands, current IOT devices deliver such a minor slice of the total cellular traffic around the world its not much of a consideration, however with new usecases and products for areas such as traffic safety, automated vehicles, drones and industrial automation, the status quo will change. As IOT becomes more commonplace and complicated, data demands might well increase, adding to network strain. Petty suggests this will be the massive gamechanger for the communications industry over the next few years and will define the case for 6G. But, who knows what the killer usecase will be for 5G, or what needs will actually push the case for the next evolution of networks. That said, more efficient use of the spectrum is almost certainly going to be one of the parameters. According to Petty, this will help with the tsunami of things but there is a lot of new science which will have to be considered. Sooner or later the industry will have to stop selling itself under the ‘bigger, badder, faster’ mantra, as speeds will become irrelevant. If you have a strong and stable 4G connection today, there isn’t much you can’t do. Few applications or videos that are available to the consumer require 5G to function properly, something which telco marketers will have to adapt to in the coming years as they try to convince customers to upgrade to 5G contracts. 4G and arguably todays vision of 5G has always been about making the pipe bigger and faster, because those were the demands of the telcos trying to meet the demands of the consumer. 6G might be measured under different KPIs, for example, energy efficiency. According to Alan Carlton, Managing Director of InterDigital’s European business, the drive towards more speed and more data is mainly self-imposed. The next ‘G’ can be defined as what the industry wants it to be. The telcos would have to think of other ways to sell connectivity services to the consumer, but they will have to do that sooner or later. What 5G is nowadays is essentially LTE-A Pro. We’re talking about 256-QAM and Massive MIMO but that is not really a different conversation. With Release 16 on the horizon and future standards groups working on topics such virtualisation, MMwave and total cost of ownership, future phases of 5G will promise so much more. The next step for Carlton is not necessarily making everything faster, or more reliable or lower latency, but the next ‘G’ could be all about ditching the wires. Fibre is an inflexible commodity, and while it might be fantastic, why do we need it? Why shouldn’t the next vision of connectivity be one where we don’t have any wires at all? Carlton’s approach to the future of connectivity is somewhat different to the norm. This is an industry which is fascinated by the pipes themselves and delivering services faster, but these working groups and standards bodies are driving change for the benefit of the industry. It doesn’t necessarily have to be about making something faster, so you can charge more, just a change to the status quo which benefits the industry. Coming back to the energy efficiency idea, this is certainly something which has been suggested elsewhere. IEEE has been running a series of conferences in California addressing this very issue, as delivering 1000X more data is naturally going to consume more energy to start with. It probably won’t be 1000X more expensive, but it is incredibly difficult to predict what future energy consumption needs will be. Small cells do not consume as much energy as traditional sites, but there will need to be a lot more of them to meet demand. There are a lot of different elements to consider here (for example environment or spectrum frequency), but again, this is a bit of an unknown. Perhaps this is an area where governments will start to wade in? Especially in the European and North American markets which are more sensitive to environmental impacts (excluding the seemingly blind Trump). Echoing Petty’s point from earlier, we don’t necessarily know the specifics of how the telco industry is going to be stressed and strained in six- or seven-years’ time. These changes will form the catalyst for change, evolving from 5G to 6G, and it might well be a desire for more energy efficient solutions or it might well be a world free of wires. Moving across the North Sea, 6G has already captured the attention of those in the Nordics. Back in April 2018, the Academy of Finland announced the launch of ‘6Genesis’, an eight-year research programme to drive the industry towards 6G. Here, the study groups will start to explore technologies and services which are impossible to deliver in today’s world, and much of this will revolve around artificial intelligence. Just across the border in Sweden, these new technologies are capturing the attention of Ericsson. According to Magnus Frodigh, Head of Ericsson Research, areas like Quantum computing, artificial intelligence and edge computing are all making huge leaps forward, something which will only be increased with improved connectivity. These are the areas which will define the next generation, and what can be achieved in the long-run. Of course, predicting 6G might be pretty simple. In a couple of years’ time, perhaps we will all be walking around with augmented reality glasses on while holographic pods replace our TVs. If such usecases exist, perhaps the old ‘bigger, badder, faster’ mantra of the telco industry will be called upon once again. One group which is counting on this is EU-funded Terranova, which is currently working on solutions to allow network connection in the terahertz range, providing speeds of up to 400 Gbps. Another area to consider is the idea of edge computing and the pervasiveness of artificial intelligence. According to Carlton (InterDigital), AI will be every in the future with intelligence embedded in almost every device. This is the vision of the intelligent economy, but for AI to work as promised, latency will have to be so much lower than we can even consider delivering today. This is another demand of future connectivity, but without it the intelligent economy will be nothing more than a shade of what has been promised. And of course, the more intelligence you put on or in devices, the greater the strain on the components. Eventually more processing power will be moved off the devices and into the cloud, building the case for distributed computing and self-learning algorithms hosted on the edge. It is another aspect which will have to be considered, and arguably 5G could satisfy some of these demands, but who knows how quickly and broadly this field will accelerate. Artificial intelligence and the intelligent economy have the potential to become a catalyst for change, forcing us to completely rethink how networks are designed, built and upgraded. We don’t know for sure yet, but most would assume the AI demands of the next couple of years will strain the network in the same way video has stressed 4G. Who knows what 6G has in store for us, but here’s to hoping 5G isn’t an over-hyped dud.